Costantino Carrara is an Italian pianist and composer. In 2011 he opens a YouTube channel just for fun, and he starts uploading some of his favorite arrangements: now there are more than 100 million views and 600,000 subscribers. Costantino was born in Bitonto in 1997 and since young, through a keyboard received as a gift from his grandparents, discovers the attractive world of music. 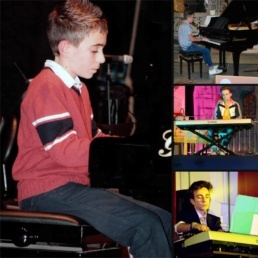 At the age of 12 years begins to take piano lessons and after only a short time he decided to open his own YouTube channel, uploading his first, but already significant performances. During his high school life, he participates in the annual school musical, taking care of the music arrangements of some stage shows taken from the great classics of Italian and foreign literature. In this way, it develops large arrangement capacity, skills that will lead him to record his music professionally. He studied classical piano at the "N. Piccinni" Music Academy (Bari, IT) for two years, but then he decided to leave and now he's currently studying jazz piano in the same Academy. It ranks second in the competition organized by Bewons, a social network for musicians, with his personal interpretation of "See You Again" recorded in the woodland. In the last years he has collaborated on several events promoted in partnership with YouTube Italy. These include participation in Medimex held in Bari and in PianoCity Milano, that allowed him important new opportunities for growth and confrontation. Today he's in partner with Yamaha Music, Musicnotes, Flowkey and collaborated with several brands, like Sony Mobile Entertainment.